On March 19, 2003, ten years ago this month, the United States invaded Iraq. Within days of crossing the border, U.S. forces began to rely upon Iraqi men and women who stepped forward in a voluntary manner to act as informal interpreters. Soon, they were hired in an official capacity, acting as a linguistic bridge between the Americans and the Iraqis. The List Project was founded nearly six years ago to protect these brave and endangered Iraqis, who were branded as traitors by their countrymen. Many were assassinated, kidnapped, tortured, and forced out of their country. When the civil war erupted in 2006, millions of Iraqis fled, but few countries wanted to offer them asylum. In 2007, the List Project worked with Senator Kennedy, who led a bi-partisan coalition of Senators in passing the Refugee Crisis in Iraq Act. Among the many intended products of that legislation was the Special Immigrant Visa, created specifically for Iraqis and Afghans working for the United States. It opened up an astonishing 25,000 visa slots, to be allocated at 5,000/year to Iraqi interpreters. The day that the legislation passed, we at the List Project naïvely thought that our mission to protect the thousands of Iraqis on our list would be completed within a year. How wrong we were. 2013 will not only witness the 10-year anniversary of the invasion of Iraq, but the 5-year expiration of the SIV program. Of the 25,000 visas promised, only about 5,500 were granted, a success rate of about 20%. Unless it is reauthorized, the remaining slots will disappear. As of December, the List Project has learned that there is a backlog of at least 1,500 Iraqi SIV cases – meaning several thousand Iraqis who wait for some sign of life in the bureaucracies. This is not an abstract policy debate. 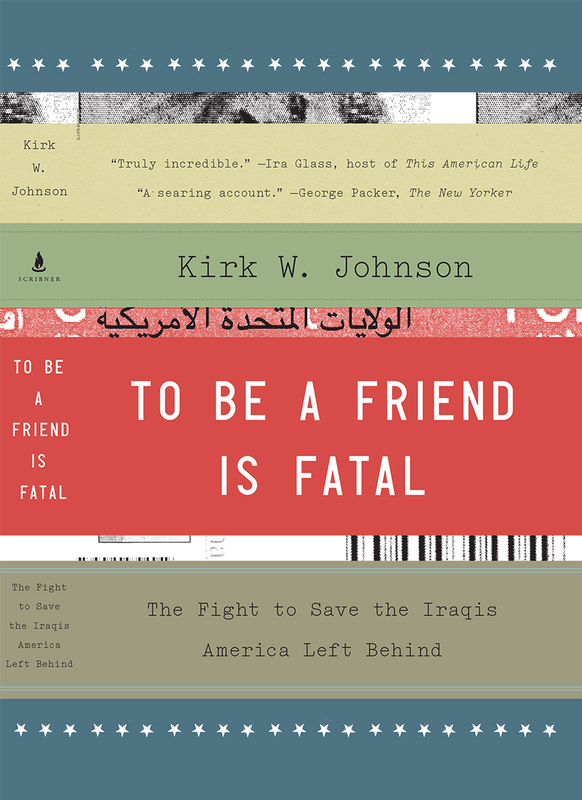 Even in the post-war Iraq, the Iraqis upon whom we relied are in great danger. The List Project continues to receive a steady stream of applications from Iraqis, who continue to receive death threats and escape assassination attempts. Last month, a former Iraqi employee of USAID narrowly avoided assassination by fleeing from gunman who were trailing his car. 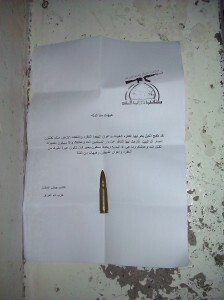 Just two weeks ago, an Iraqi received this death threat, which included a round from a Kalashnikov – a familiar tactic. But unless their case is expedited, they could be looking at a wait of two years before they find safety. This is how the world’s only superpower repays them for their service: with a promise on paper, strangled by red tape. On March 5th of this year, several members of Congress signed onto a letter to President Obama urging him not to forget these Iraqis. They also called attention to the thousands of Afghans who served alongside our troops. If the Iraqi SIV program has been a failure, the Afghan program is even worse. As the United States accelerates its plans for withdrawal, these Afghans will almost certainly be left behind. Over the past 12 months, there has been an average of only 20 Afghan cases cleared each month: several of those months saw zero or only 1 case cleared. We can expect the backlog of cases, around thousands of individuals long, to grow as more and more bases are shuttered throughout Afghanistan. Some members of Congress are currently circulating draft legislation that would reauthorize these programs, a commendable step. But if the past six years have taught us anything, it is this: unless the President prioritizes this, the Executive Branch agencies under the his authority will continue to flounder along. Congress has routinely led on this issue, passing bills that are then rendered impotent by bureaucratic delay. A simple reauthorization to the program is necessary, but we should not kid ourselves: if the pace at which SIVs have been granted holds, it will take more than a decade – 2023 – to issue the remaining visas. I am very sorry to hear about this. I will “share” this article on Facebook so that my “friends” will be able to read it as well. I will also email the link to my friends. If there is anything else I can do, you have my contact information. Please do not hesitate to ask. I have applied to the SIV program but they refused my application for the reason of 11 days to complete one continued with the US but my badge says that i have spend more than one year after i got my recommendation from my supervisor>>>now iam still in iraq?how you can help me? Hi,my name is Amad, i have been waiting to hear from US embassy at Kabul. I was interviewed at the embassy seven months ago for SIV, however I have not heared anything from them. I think US betraded us, and will leave us for Taliban to kill us. I have wasted my 9 years working for US government. Feel sorry for all those who Scarified forUS!! 202-456-1414–make this happen ASAP. Golden Rule.